In the morning drive from you hotel in Hangzhou city to Wuzhen Water Town (about 75km away from Hangzhou), one of six ancient water towns south of Yangtze River with 1200-year-old history, the residential houses are built beside rivers, while on both sides of streets, abundant ancient architectures of Ming and Qing Dynasties still remain as they were. Strolling along the ancient slab stone-paved streets, looking at its black tiled, tung oil painted timber framework houses, it seems you are walking into a traditional Chinese wash painting and experiencing an atmosphere of antiquity. 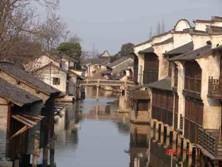 During the visit, you can pay a visit to Jiangnan Hundred Beds Showroom, Indigo-Blue Printed Calico Workshop, Mr.Yu Liuliang's Coin Display Room, Shadow-puppet Theatre, Ancient Stage, Pawn Museum.